The teacher who was in my room before me had been teaching at my school for about 15 years. The teacher before her had been teaching in my room since the late 80s. Neither of them felt the need to remove anything from the room upon their respective retirements. Little by little, I have been purging. I have entire sets of Weekly Readers from the 90s. I have file folders of notes from parents from 2000 - notes like, "Susie will not be at school today because she has a sore throat." I did have a stack of records that I found shoved in a cabinet, but those were donated to Purple Heart many months ago. Today I tackled an entire file cabinet so I could start using it for actual storage! I threw 99% of everything inside it away. 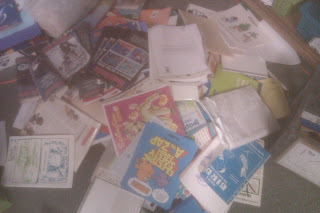 Well, it's actually in piles on my floor so I can recycle it in the morning. Here's what it looked like before I piled it up! A ton of the stuff was way outdated. A few things I thought I miiiight be able to use, but then I remembered my mom saying: if you got through half the year already without knowing what was in the cabinet, you can survive without it. Plus, everything I get from blogs totally trumps the worksheet graveyard that is my floor. While poking around in the closet, I also found a little Christmas tree (that I forgot to take a picture of) and a nativity scene! 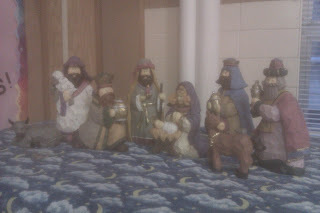 I don't know where Joseph is... unless one of the shepherds is supposed to be him?? 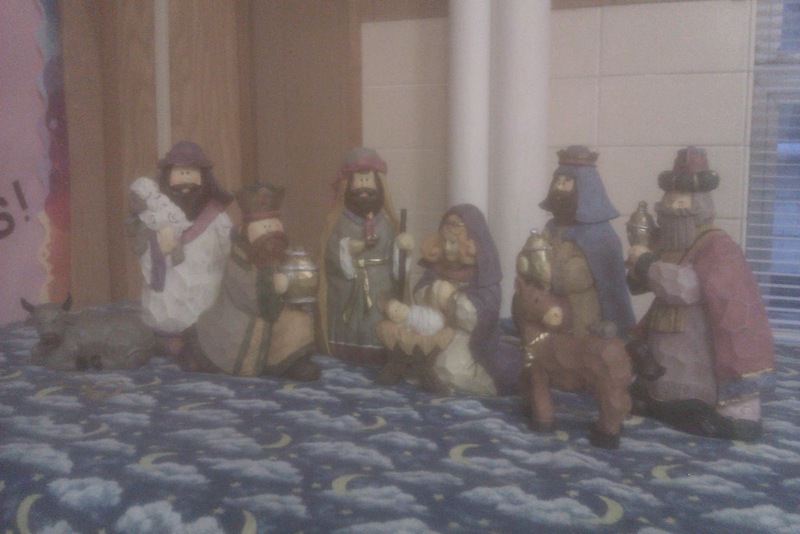 I put one next to Mary just in case. :). We finished our gingerbread man glyphs that I got from Denise at Sunny Days in Second Grade! I didn't hang them up yet and I forgot my camera today sooo I will put those pictures up tomorrow! And I continue to get rave reviews about my math quilt that I got from Reagan at Tunstall's Teaching Tidbits!!! I just want to marry that quilt! The whole day was not great though! One of my second graders hit someone in the face with a chair leg today. Awesome. And our second class frog lost its life over the weekend. Also I've had the songs from the Christmas program stuck in my head all day. Ahhh!! Luckily tomorrow is the program! Go first and second graders go! You totally rock!!!! I heart you BIG TIME!!!!! Congratulations, I'm passing the Liebster Award to you! This award is passed to up-and-coming blogs who have under 200 followers. I know how you feel! I've been in my classroom for 3 years and STILL haven't cleaned everything out. I found teacher magazines from the 1940s! I feel your pain! My first two classrooms had so much stuff in them! How is it possible for so much stuff to be crammed into one classroom?! Good luck with the rest of your cleaning and organizing.